Paul McCartney, The Beastie Boys, David Bowie and more sported the iconic mullet. Business in the front, and party in the back, the mullet hairstyle took the late 80's, early 90's and both redneck and bogan population by storm! 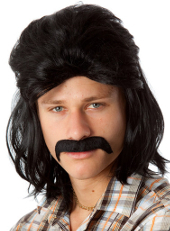 Dress up as Macgyver, Uncle Jesse or Dr. Eugene Porter from The Walking Dead, your costume won't be complete without a mullet, and this set even includes the Village people or Magnum PI inspired moustache as well!